In 2004, Tracy Skrabal, a senior coastal scientist with the North Carolina Coastal Federation, led one of the first living shoreline projects in North Carolina, which replaced a failing bulkhead at a high wave-energy site in a freshwater setting. The site was at the Edenhouse public boat ramp along the Chowan River in North Carolina. It proved to be an effective early demonstration of living shoreline techniques, combining erosion control practices with the restoration of a freshwater marsh and native riparian buffer vegetation. The team also gained valuable insights on controlling seaward and landward sources of erosion. Practice adaptive management. Since the project was located in a high wave-energy area, the team quickly realized the need for a “speed bump” to slow wave energy in order to fully mitigate the erosion forces. The combination of a stone sill and vegetative planting techniques for this living shoreline project helped shape future work. Consider the plants’ needs. Riparian plants need a lot of water. Before starting construction, think about how to water them, and consider planting shrubs and trees during the rainy season. Avoid hurricane season. While hurricanes cannot be predicted, the season can, so plan accordingly. A hurricane came through during this project, causing many new plants to be lost and exacerbating the erosion. Supplement the soil. Before planting, test the soil to determine if supplementation with organics is necessary. Reduce the amount of fill used. It might not be necessary to use much or any fill in intertidal areas. Many projects work better if there’s an open space between the sill (if used) and emergent plants so sediment can collect naturally. Fish and shorebirds also love to use this shallow protected area behind the sill. This approach also helps keep the project cost down. Consider other sources of erosion. Be sure to think about nearby roads and parking lots that might be contributing to stormwater runoff and shoreline erosion from the landward side. If not addressed, these features can undermine the living shoreline project and should therefore be included in the design process. Consider construction materials. More than one material may work for a shoreline, but consider the one that will work best for the existing conditions and energy levels. For example, oyster shell bags are often an excellent alternative to stone, but only where naturally occurring oysters are already growing. Start small and design well. If the community is new to living shorelines, don’t start with a project that might be controversial. Start with something small and well-engineered as a demonstration project so that it can be easily transferable and permitted in the future. Living shoreline techniques to reduce erosion and enhance fish habitat along a freshwater river. The Edenhouse boat ramp is a popular public access point on the Chowan River off the Albemarle Sound in North Carolina. 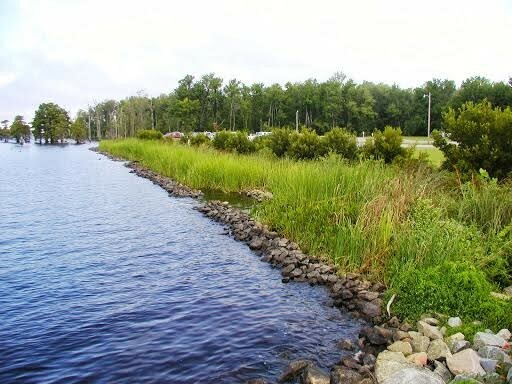 When the North Carolina Wildlife Resources Commission, which manages the boat ramp, noticed that erosion was increasing and the existing 400-linear-foot bulkhead at the site was failing, they wanted to explore more effective and sustainable solutions. While replacing the existing bulkhead was the easiest solution, they learned after contacting the North Carolina Coastal Federation that a living shoreline would work well at this freshwater, wind-driven, high-energy site. At the time, there were no examples of living shorelines projects along freshwater sites in North Carolina. 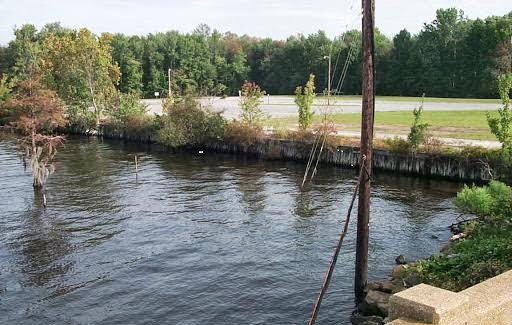 This image shows the failing bulkhead along the Chowan River. 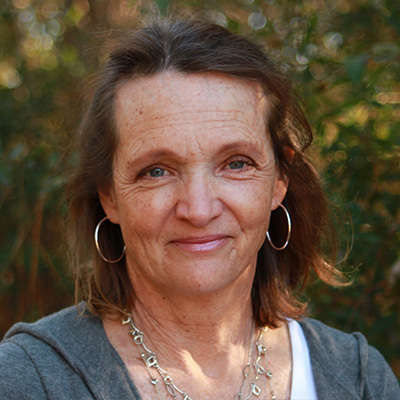 With funding from NOAA’s Restoration Center, Tracy Skrabal, a senior coastal scientist with the North Carolina Coastal Federation, helped the Wildlife Resources Commission with the project design and permit applications. The design process included research of the erosion history and potential sources, the fetch, energy regime, existing site conditions and bathymetry, and construction considerations. Tracy provided training and oversight to the commission and project contractors, who collaborated on the project construction. Construction included removing the failing bulkhead, regrading the shoreline, constructing the gapped stone sill, and planting aquatic vegetation, freshwater marsh plants, and an upland buffer with grasses, shrubs, and trees. Tracy also noticed that stormwater was running off from a parking lot adjacent to the boat ramp, creating erosion along the shoreline from the landward side and potentially undermining the function of the new living shoreline. To address the runoff, the contractors regraded the grassy area next to the parking lot and created a slight vegetated berm and swale to redirect stormwater. The material removed to create the vegetated swale was used to create the small berm, which was planted with native shrubs and trees, directly adjacent to the shoreline. This small design addition ensured that stormwater would not erode the bank and undermine the newly planted living shoreline. Because of high wave energy and the passage of a hurricane in 2004, it took a few years for the site to completely stabilize. Nevertheless, the site proved to be very successful, both in demonstrating the success of living shorelines as a stabilization technique at a freshwater, high wave energy site, and also as an ecological restoration project. In addition to the continued growth of over 15 species of freshwater wetland and native upland species, the site has provided an adequate “quiet zone” landward of the sill to allow for the colonization of two species of native submerged aquatic vegetation. The successful demonstration of the Edenhouse project and other similar projects has also assisted in the development of revised rules related to living shorelines in North Carolina, with the goal of encouraging similar projects throughout the state’s coastal region. The Wildlife Resources Commission also learned more about the connection between stormwater runoff and shoreline erosion. After this project was complete, the commission installed a number of additional low impact development techniques to further reduce and infiltrate runoff from the parking lot. They added an infiltration trench, which has eliminated any potential runoff, and are committed to improving water quality and reducing erosion. They now understand that they can accomplish both goals at the same site. This image shows the completed living shoreline restoration project.